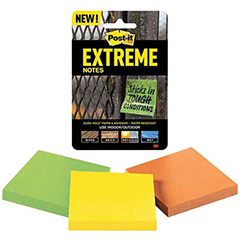 When conditions make communication tough, Post-it Extreme Notes make leaving notes and reminders simple, so you can get the work done. Made with Dura-Hold Paper and Adhesive, these notes will hold up in hot, cold and wet conditions. They stick to tough and textured surfaces like concrete, raw and painted wood, and tile. Make sure your message is seen with a note that sticks in tough conditions. Not recommended for use on paper. Apply to dry surface, then can get wet.